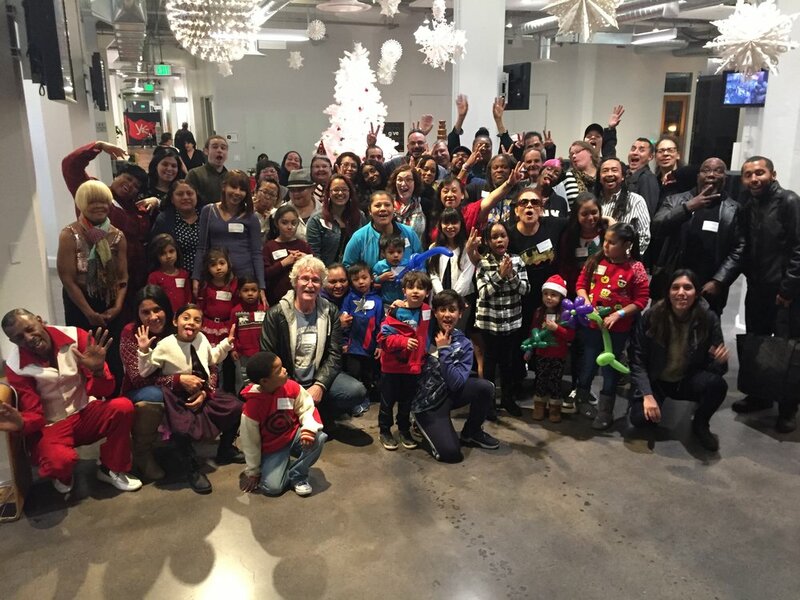 On December 6th, Tenderloin Safe Passage Corner Captains, along with Tenderloin Community Benefit District staff and board of directors, were treated to an amazing holiday celebration hosted at Microsoft headquarters at 1355 Market Street. Beyond the party, Microsoft has been an amazing supporter of the Safe Passage Program, contributing financial resources, expertise, and volunteers for the past several years. We could not do what we do without you. Thank You! A special recognition must be made to Leslie McGowan and Gabriela Costa for leading the entire event. Leslie and Gabriela took care of every single detail, from the chocolate fountain to the 65 gifts that were purchased from the wish list Corner Captains and their families. Children (of all ages) got to run around, play games, face paint, decorate cookies and other confections. It was a special treat for all of us. During the celebration, Program Director Kate Robinson reflected on the growth of Safe Passage from an entirely volunteer operation started by neighborhood moms to their coming back to the TLCBD. Safe Passage Corner Captains have become the heart and soul of our organization. They are an incredibly diverse set of community members who proactively take on a difficult job for the sake of improving the quality of life for the children, seniors, and the greater Tenderloin community. We are inspired everyday by their effort, and it means so much to us that Microsoft would put this together to honor their commitment and to bring extra joy to their families during the holidays.